Duluth is the world’s third largest inland port located about as far as possible from an ocean on the North American continent. Superior, Wisconsin, sits to the south on the other side of the harbor. Shipping, mainly grain and, to a lesser extent, iron ore, is an important part of the economy. Some of the former heavy industry is gone today but the town still retains a decidedly commercial and industrial character. The city has taken effective steps to turn potential decay into an attractive preservation of its heritage, and downtown today is clean and interesting and in an attractive waterfront setting. Many classic industrial buildings and features have been renovated and some house entertainment and nightlife venues in a waterfront area known as Canal Park. Outdoor recreational opportunities abound in the lake and forest country to the north, and Duluth serves as a gateway to these areas. Winters are extreme and the area is far from major air transport and other services. Duluth in total is about 20 miles long and lies at the base of a range of hills and bluffs that rise abruptly 600 feet to 800 feet above lake level. The climate is continental with significant effects from Lake Superior. Summer days are warm, sometimes with clouds from the lake, and evenings are cool. Winters are cold and bitter when the lake doesn’t moderate temperatures. The area averages 51 below-zero days a year, making it the fourth coldest in the nation. Low-pressure systems passing to the south cause easterly winds across the lake bringing significant snowfall. Easterly winds, the major weather modifier, occur almost 50% of the time in summer and up to 25% in winter. Snow is dry and persistent and ice may form in the harbor from November through April. First freeze is late September, last is mid-May. The median home price in Biwabik is $74,400. Browse Homes in this Range. 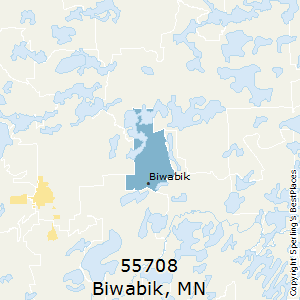 Compare Biwabik (zip 55708), Minnesota to any other place in the USA.